Studies have shown sleeping on an incline can reduce many sleeping issues such as acid reflux, snoring, and allergies. The InteVision Foam Wedge Pillow is built off this principle. In addition to its unique shape and size, what really stands out about this pillow are the Amazon reviews. There are plenty of anti-snoring pillows on the market, but few (if any!) receive over 1,200 four-star reviews on Amazon. With all the fanfare of this pillow, I thought it was time to test it out for myself and see if the pillow is worth all the buzz. From the picture, you can see the wedge pillow stands up to its name. Its dimensions are 26” x 25” x 7”, so it’s not small. The wedge pillow is white in color and is composed of 2 layers of material: the base layer is a firm foam, and the top layer is 1” memory foam. This two-material design has incorporated built-in channels between the two layers to increase air circulation. Included with the pillow is a machine-washable white cover. 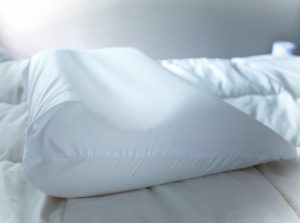 Because of the pillow’s popularity, the manufacturers have also released an optional 400 thread count, 100% Egyptian cotton pillowcase. 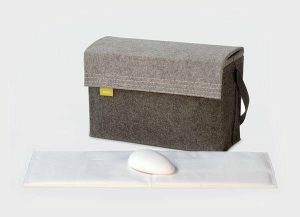 The wedge design of the pillow is intended to provide a firm cushion while also providing gentle support to raise the upper body. Sleeping on a wedge causes you to sleep upright, which can improve snoring as well as other types of sleeping problems such as acid reflux, poor circulation, and neck and back problems and even post-nasal drip. The pillow can also be used to elevate the legs if that is your sleeping need. It can also be used as a trunk stabilizer if you need support while sleeping on your side. The gentle slope of the pillow is intended to keep airways open, thereby reducing or even eliminating snoring. With so many outstanding reviews of this pillow on Amazon, I really needed to purchase this pillow and test it out. 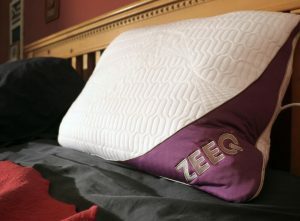 So many people mentioned in their reviews the pillow either helped or eliminated their snoring altogether! At $33.36, this pillow was a great deal on Amazon. The package arrived tightly rolled in a compact box. After removing the packaging, I had to wait about 2 hours for the wedge to open to its full size. I purchased the wedge that has a gentle slope up to 7.5”, but if that is not steep enough for you, the manufacturer also sells this same pillow with a 12” incline. I was amused when I placed the pillow on my bed. To say it’s a big pillow would be an understatement. Sleeping on an incline seemed a bit odd, but it wasn’t uncomfortable and I quickly got used to it. Despite its incline, I had no problem falling asleep on the pillow. Overall the pillow was very comfortable, and it was incredibly easy to fall asleep. As with all the other anti-snoring devices I’ve reviewed, I needed to see if the pillow was not only comfortable but also worth my money as an anti-snoring device. I turned on the snoring app on my phone, SnoreLab, and went to bed. When I checked the app in the morning, I saw that I had no visible decrease in my snoring for the night. I snored in the first hour and then again in the early morning. My wife did mention that she woke up during the night and I was snoring a little at that time. She also said I was sleeping on my back, which is the position in which most snoring occurs. The wedge pillow is so comfortable for back sleeping; I can see how I would have naturally gravitated to a supine position. I was a little disappointed the pillow did not reduce my snoring, so I did some more research. I checked the Amazon reviews and saw the reviewers that said the pillow helped reduce their snoring were either allergy snorers or nasal snorers. I am neither of those, and this pillow did not work for my type of snoring. Although I had one night with poor results, I wanted to give this popular pillow one more night. This time, I decided to combine the pillow with a positional therapy device called the SlumberBump. The SlumberBump fits around my chest area with an inflated bag on my back. This configuration prevents me from being able to sleep on my back at night. By using the SlumberBump, I wanted to see how the InteVision Wedge Pillow would work for side sleepers. When I woke up the next morning, I saw that my snore score had decreased 50% when using the SlumberBump. But, I could not tell if the reason my snoring went down for the night was because of the positional therapy device or the pillow. In the end, I will not continue using the InteVision Wedge Pillow because the only way it reduced my snoring was with a positional therapy device in place. I find wearing a positional therapy device to be uncomfortable and if wearing one to force side sleeping is the only way to decrease my snoring with this pillow, I will choose another method. Cost. Anti-snoring pillows run the gamut when it comes to pricing and the InteVision is in the low range. Easy shipping from Amazon and a low cost are a plus for this pillow. Great for Snoring Caused by Allergies or Nasal Snoring. Amazon reviewers who love this pillow tend to snore either due to allergies or because they are nasal snorers. If you fall in either of those categories, this pillow might be a reasonable solution for you. Great for Side Sleepers. If you are the type of person that sleeps on your side, you might want to give this pillow a try. I saw a 50% decrease in my snoring when I was forced to sleep on my side. Although being forced into that position with the SlumberBump was uncomfortable for me. If sleeping on your side is comfortable for you, this pillow might help with your snoring. Slipping. Several Amazon reviewers said that they slipped down the pillow when using it. I did not have this problem, but I also did not use the pillow case. The pillow case may cause the slippage, so you might want to try it without the pillow case if you have problems with slipping. Not for Stomach Sleepers. This pillow is not for people who like to sleep on their stomach. It is impossible to sleep on your stomach unless you position yourself at the bottom of the pillow where it is thin. Sleeping that far down on the wedge is not comfortable. The InteVision Wedge Foam Pillow seems to only work for side sleepers, nasal snorers or allergy sufferers. If you are a mouth breather and snore, take a look at a tongue trainer such as the “Dream Sipper”. Because this pillow only works for certain types of snorers, we cannot rate it very high. Although more expensive, the Nitetronic pillow has been proven to be effective in a 2014 sleep study. You can view our Nitetronic anti-snoring pillow review here.